We’d love your help. Let us know what’s wrong with this preview of Literary Wonderlands by Laura Miller. A glorious, full-illustrated collection that delves deep into the inception, influences, and literary and historical underpinnings of nearly 100 of our most beloved fictional realms. Literary Wonderlands is a thoroughly researched, wonderfully written, and beautifully produced book that spans two thousand years of creative endeavor. From Spenser's The Fairie Queene to Wells A glorious, full-illustrated collection that delves deep into the inception, influences, and literary and historical underpinnings of nearly 100 of our most beloved fictional realms. To ask other readers questions about Literary Wonderlands, please sign up. This is a truly beautiful book, with gorgeous color illustrations on almost every page 2-page spread, so reading it, even flipping through it, is a delight. The first thing I did was check to see which of my favorite literary worlds had been included (Strange/Norrell! Thursday Next! And many others! ), and I read those entries feeling great pleasure and satisfaction to see the texts I love treated with such respectful and thought-provoking attention. But discovering new-to-you authors is the bigg This is a truly beautiful book, with gorgeous color illustrations on almost every page 2-page spread, so reading it, even flipping through it, is a delight. The first thing I did was check to see which of my favorite literary worlds had been included (Strange/Norrell! Thursday Next! And many others! ), and I read those entries feeling great pleasure and satisfaction to see the texts I love treated with such respectful and thought-provoking attention. The entries were authored by an impressive list of knowledgeable and talented writers, some of them scholars or historians, and some of them creators of their own literary wonderlands, like Lev Grossman (his The Magicians series is, sadly, not included in the book). Essays are arranged in 5 chronological groups: Ancient Myth and Legend, Science and Romanticism, Golden Age of Fantasy, New World Order, and The Computer Age ( a strange title choice because most of the stories in this group have nothing to do with computers). Many, but not quite all, of the authors are from Europe or the United States. This would be a great holiday gift for anyone (including yourself) who loves fiction. Recommends it for: NO ONE. NO ONE EVER. I can’t remember the last time I read a book that made me this angry. I probably shouldn’t be quite so mad. As a whole, this is a fluff-piece, clearly not meant seriously; as amply demonstrated by the shallow blurb-like summaries of each ‘literary wonderland’. Few of the ‘essays’ even quote from the material, and when they do, it’s only once; none of the ones I read (in the spirit of honesty, I should tell you that I only made it halfway through the book before wishing I had a paperback copy to s I can’t remember the last time I read a book that made me this angry. I probably shouldn’t be quite so mad. As a whole, this is a fluff-piece, clearly not meant seriously; as amply demonstrated by the shallow blurb-like summaries of each ‘literary wonderland’. Few of the ‘essays’ even quote from the material, and when they do, it’s only once; none of the ones I read (in the spirit of honesty, I should tell you that I only made it halfway through the book before wishing I had a paperback copy to set on fire, so it is theoretically possible that the essays in the latter half of the book are better) discuss what makes each wonderland worthy of inclusion among ‘the greatest’, or what effect each had on the readers and society of its time. Few give any meaningful cultural or historical background, and then only in crumb-form. A book like this is probably always a risk: it’s probably impossible to make a list of the ‘greatest’ without upsetting someone. Someone will always be confused or offended that their particular favorites didn’t make the cut. And I will freely admit that I am not a personal fan of most of the works listed in the first three sections of the book (ANCIENT MYTH & LEGEND, SCIENCE & ROMANTICISM, and GOLDEN AGE OF FANTASY). But there are some very gaping exclusions that I find personally unforgivable; The Tale of Genji, written by Murasaki Shikibu in 11th century Japan, inarguably the world’s first/oldest attributed novel (there are older pieces of literature, but we don’t know who wrote those), is one. Instead, Literary Wonderlands claims that honor for Don Quixote, written centuries later. There is also no mention of the Kalevala, the Finnish legendary epic which inspired Shakespeare’s Hamlet and is recognized as being the foundation of Tolkien’s Silmarillion and Lord of the Rings; Tolkien’s love of and fascination with the Kalevala is well-documented. For that reason alone, I would think the Kalevala ought to have been included, and that’s without delving into what an incredible, and extremely old, epic piece it is. Mary Shelley, despite almost universal agreement that her Frankenstein constitutes the first science fiction novel, is nowhere to be found either. 'Who is the Shapespeare of imaginative fiction? For many it's a debate between HG Wells and Jules Verne…' <--ACTUAL QUOTE FROM THIS PYRE OF AWFULNESS. In fact, that’s what first set alarm-bells ringing for me; a quick glance at the table of contents shows very few female authors listed at all. THE COMPUTER AGE includes Lois Lowry, Margaret Atwood, JK Rowling, Cornelia Funke, Susanna Clarke, Suzanna Collins, Ann Leckie, and Nnedi Okorafador – eight names out of the 22 authors included in the section. NEW WORLD ORDER, which precedes it, includes Ursula Le Guin, Gerd Mjøen Brantenberg, Angela Carter, Octavia Butler - and that's all. Four names out of the 21 in that section. There’s no mention of Madeleine L’Engle. No Anne Rice. No Connie Willis. Doris Lessing is mentioned in passing, but none of her works are featured, despite her having won the Nobel Prize for Literature. There’s no Marion Zimmer Bradley, who, while a disgusting piece of human trash, nonetheless produced multiple groundbreaking works in the fields of speculative fiction. NK Jemisin, Jacqueline Carey, Martha Wells, Catherynne Valente, and Kate Elliott have all created breathtaking and mindblowing fantasy and science fiction worlds, but none are included here. Julie E. Czerneda, C.J. Cherryh, Lois McMaster Bujold, James Tiptree Jr, Jo Walton, Mercedes Lackey, Mary Stewart, Anne Bishop, Meredith Ann Pierce, Jane Yolen, Joanna Russ, Patricia A. McKillip, Nicola Griffith, DIANA WYNNE JONES, Elizabeth Bear, Suzette Haden Elgin - I could sit here typing names for hours and yes, of course not all of these authors could have been included if the editors wanted to keep this book as fluffy and short as they clearly did. But that doesn’t excuse the fact that so many of them are missing. If I’m being kind, I’ll theorise that there were two ways the editors chose which authors/works to include. Either they wanted works that featured secondary worlds/societies that were intricate, impressive, and groundbreaking – so, demonstrations of immense literary craft on the part of the author – or they wanted works which precipitated literary or cultural revolution. By either standard, most of the authors I just listed should have been included. How can anyone make a list of ‘greatest fictional worlds’ and exclude Diana Wynne Jones? How can you talk about the history of speculative fiction and ignore James Tiptree or Marion Zimmer Bradley? The lack of female-authored works is enraging, but that’s all without touching on the airy fluff pieces of the essays themselves. As mentioned above, each one mostly summarises the plot of the work; as someone who studied the Odyssey for two years at A Level, the banal three-page blurb written on it for this book makes me want to scream. For example, there’s no mention of the incredible cleverness of the very language used in the Odyssey, word-play and cultural jokes only intelligible with some understanding of the time period and Ancient Greek itself. There’s no mention of the fact that ‘Homer’ almost certainly didn’t exist, or that modern scholarship is leaning more and more towards the idea of both the Odyssey and the Illiad as having been written by a woman. There’s no real explanation as to why the Odyssey is so groundbreaking and impressive, or why it has resonated so strongly with readers throughout human history. And every piece is like that. Even when, as in the essay on The Water Babies, some of the motifs used in the text are decoded for non-Victorian Age readers, no mention is made of why, how, or even if the literary wonderland in question affected readers so strongly as to make it into this book. The standard by which these fictional worlds were selected for this collection is entirely missing; nor is there any explanation of why so many major pieces of fiction by women have been overlooked. All in all, this is a stupidly pretentious fluff-piece whose authors prove their very unsuitability for crafting such a collection by their ignorance of those genres they purport to have studied so carefully. This is not a list of ‘the greatest’ any genuine speculative fiction fan can support, and the essays on each work do nothing to explain why even those greats included are so great. People have been immersing themselves in stories for thousands of years, originally these were passed from person to person before someone had the genius idea of writing them down. What stories though are the defining example of a type? Literary Wonderlands tries to do this by picking around 100 books and series that they think have redefined the literary landscape when they were published. There are five sections of books, beginning with Ancient Myth & Legend and then Science and Romanticism People have been immersing themselves in stories for thousands of years, originally these were passed from person to person before someone had the genius idea of writing them down. What stories though are the defining example of a type? Literary Wonderlands tries to do this by picking around 100 books and series that they think have redefined the literary landscape when they were published. There are five sections of books, beginning with Ancient Myth & Legend and then Science and Romanticism it then goes onto the Golden age of Fantasy a New World Order and finishes up in the Computer Age. There are classics such as The Odyssey and Beowulf and the Tempest, The Time Machine and The Water Babies and it brings pretty much up to date with Ann Leckie's Imperial Radch trilogy. I was pleased to see favourite authors like Sir Terry Pratchett, Iain M. Banks and Neil Gaiman, and titles that I had read and enjoyed like Snow Crash and Neuromancer that I hadn't expected to make it in. I'm not sure what I expected this to be but as I was reading it, I kept thinking, "This isn't what I expected it to be." I know that makes no sense. It's still a beautiful book and I enjoyed every page. Fills a gap we didn't know existed, and still aren't sure. A supposed catalog of the lands of fantasy and science fiction through the ages. Is more like a survey of those fantasy and fiction works through the ages which created worlds or universes. Over a hundred entries, so the coverage is shallow. I fell in love with this in the bookshop. I have a great weakness for books about books and leafing through the pages of beautiful illustrations and biographies of fantasy worlds that I had loved over the years, I felt that this was a book that I really needed to have for my own. Fortunately, it was just before Christmas and Santa Claus (in the guise of my parents) was very obliging. Tracking back from early mythology all the way through to the modern age, Literary Wonderlands is in the words of its creator Laura Miller is a compendium of the 'lands that exist only in the imagination', offering a panoramic view of the development of story-telling. Bibliophiles will delight. Miller emphasises in her introduction that the book is designed to focus on one of the 'least celebrated' aspects of reading; 'its ability to make us feel transported to a different time and place'. Along with a vast team of contributors, Miller has grouped the literary wonderlands by era, going from Ancient Myth and Legend to Science and Romanticism through to the Golden Age of Fantasy and then on to New World Order before finishing up with the Computer Age. 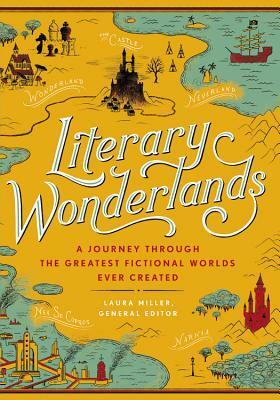 Providing synopses and background information for each of the almost hundred wonderlands featured, we gain valuable context about the influences behind many of the most celebrated works of creative fiction. Of course, when one actually reads through the wonderlands, one realises that being transported to these places would not be as desirable as all that. From the Hell in Dante's Divine Comedy to the terrifying world of The Water Babies (this scarred me as a child) to the Gilead of The Handmaid's Tale, all too often the author's wonderland has many of the aspects of a nightmare. Personally, I have always thought that even Alice's Wonderland is a horrifying story with pretty illustrations. Yet there are others such as the book world of Thursday Next and Moominvalley which have much warmer memories and the wealth of illustrations in this book only serve to remind us of why they captured our imagination in the first place. Collected together, it becomes possible to see trends in story-telling which go beyond the individual author inspiration. It was striking however that the Ancient Myth and Legend section stretched from 1750 BCE to 1666 AD while subsequent sections tended to be a century or so at most, with the Computer Age chapters lasting only the last thirty years. Additionally, while Miller has examples aplenty for each of her categories, there were a number of notable absentees, such as Mary Shelley's Frankenstein. This was particularly strange given that in the segment on Never Let Me Go, the former novel is hailed as the first piece of true science fiction. Moreover, Literary Wonderlands is centred on mostly Western literature, meaning that a number of works are cited without reference to the non-Western pieces which inspired them. More peculiarly, as we move through the sections, there were an increasing number of books which did not seem to be taking place in a wonderland at all, but in worlds strikingly similar to our own. Does The Handmaid's Tale 'count' as fantasy literature? Does speculative fiction transport us to an entirely new time and place? Where does the border come between the two? It was odd too how Miller seemed to pick the first novel in a series as the point of focus for a segment without considering its place within its individual canon. So, the Moomins are represented by The Moomins and the Great Flood even though Literary Wonderlands acknowledges that this book is non-canonical and that most agree that the story's true continuity did not begin until Comet in Moominland. Similarly, Peter Pan in Kensington Gardens is featured rather than Peter Pan itself. Because of this, I felt that some of the wonderlands that I loved the best did not quite get their fair coverage. Tonally, the book is rather disjointed. This is unsurprising given that there are over forty contributors, but it does mean that certain entries are more readable than others. It is not immediately clear who has written about which book, further complicating the issue. That being said, there are some truly fantastic passages, such as the closing lines on The Chronicles of Narnia: 'It isn't the elaboration of the backdrop that casts the spell, that makes the place seem real in spite of its many absurdities, but the inexhaustible delight of the dancers who inhabit it, as well as the man who made it'. So very, very true. There is a real tenderness too in the descriptions of Douglas Adams' The Hitchhiker's Guide to the Galaxy and Terry Pratchett's Discworld. The one thing I did find a little sad however was how few quotations were made from the original material; the pictures and illustrations are stunningly beautiful but it was the words that transported us in the first place. What intrigued me most however was the realisation that creative ideas recur over time. Egalia's Daughters: A Satire of the Sexes was published in 1977 and seems to feature many of the same themes as Naomi Alderman's recent bestseller The Power. I would imagine that this comes from the ongoing frustration of women with our patriarchal society but I was fascinated by how Alderman's novel could be hailed as ground-breaking when another book had achieved success with the same message so comparatively recently. Indeed, many of the wonderlands do seem to be inter-related, with numerous examples of cross-pollination. I wondered, was this because the stories we hear in childhood leave a mark which decides on the ultimate path of our own future imaginings? Or are there just a finite number of fresh ideas in the world? While not quite qualifying as encyclopedic, Literary Wonderlands is a feast for the book-lover and a wonderful chance to revisit old friends. I found a number of books to be added to the TBR pile and enjoyed tracing the lines of intertextuality. Despite the impressive credentials of its contributors, this is less an academic piece as it is a joyous recognition of fiction's power to make us visualise the product of someone else's imagination. While Wonderlands is not without its flaws, I am still smitten with its unabashed enthusiasm for its subject matter and of course, the beauty of the book itself. It's not that there's anything wrong with this book but I didn't find it to be a useful reference work. The entries are short and superficial. And scattershot. I'm not sure what the guiding principle for including an author was. A much better reference (and one that manages to pack a lot of useful info into short entries) is John Clute's The Encyclopedia of Fantasy. I did extract two titles of interest, so the effort wasn't entirely in vain. First of all, "worlds" is a misnomer. Many of the entries picked were closer to magical realism, or just simply invented cities or places. At some point, "world" has to mean something different, or any invented town in any drama fiction novel would count. For example... Pale Fire by Nabokov? That's hardly a world, now is it? One Hundred Years of Solitude? Several of these only work in the context of our world at all. yes, Hundred Years has magic in it (or does it? symbolic imagery exists, author First of all, "worlds" is a misnomer. Many of the entries picked were closer to magical realism, or just simply invented cities or places. At some point, "world" has to mean something different, or any invented town in any drama fiction novel would count. For example... Pale Fire by Nabokov? That's hardly a world, now is it? One Hundred Years of Solitude? Several of these only work in the context of our world at all. yes, Hundred Years has magic in it (or does it? symbolic imagery exists, author) The whole point is that it's Mexico, it can't be without it being Mexico, and so it MUST be in our world. Not to mention Kindred. How on earth is that a separate world? The whole conceit is about seeing the truth of the world we live in and the lies we tell each other. As the book continued, the pieces seemed to get fluffier and more summary-like. My favorite parts were where the authors talked about how the created world(s) impacted literature and culture that followed it. That also decreased as the book went on, which I guess is slightly acceptable because it was going forward in time, but also not really, because otherwise why include it? Mostly I just quibbled with what they included and what they didn't. All in all, it was an ok book to flip through, but not much past that. This was an interesting read, and I learned a lot of good trivia behind many of the worlds presented. It also served as a good preview for several books I haven't read. My to-read list is now a little longer (as if it wasn't long enough already), although I now also know of a few books I'll most likely never want to touch. Overall, this is a nice overview of the evolution of fictional worlds. That being said, a few of the choices confused me. Why was Asimov's I, Robot featured but not his Foundat This was an interesting read, and I learned a lot of good trivia behind many of the worlds presented. It also served as a good preview for several books I haven't read. My to-read list is now a little longer (as if it wasn't long enough already), although I now also know of a few books I'll most likely never want to touch. Overall, this is a nice overview of the evolution of fictional worlds. That being said, a few of the choices confused me. Why was Asimov's I, Robot featured but not his Foundation series? I, Robot certainly had a major impact on science fiction, but Foundation seems like it has a larger focus on world-building. Also, I'm sure most readers will find at least one world she/he is surprised did not make it in. (My coworkers and I came up with North America in A Canticle for Leibowitz, Arrakis from Dune, and the aforementioned Foundation universe, just to name a few). Also, the essays themselves varied in quality. Some were brief but meaningful explorations of the worlds presented, while others were little more than summaries. Overall, I would say this book is worth reading, if for no other reason than to improve your to-read list. I don't understand what the point of this book is. It is very different than I expected. It is just a list of summaries of 100 books. Ancient Myths and Legends includes the epics you'd expect, and many of which I've read. Each 2-4 page summary includes beautiful artworks illustrating scenes from the stories; books from later eras also have author photos, maps of the fictional worlds and stills from film adaptations. The Description of a New World, called The Blazing World (1666) by Margaret Cavendish, Duchess of Newcastle, and apparently an inspiration for Virginia Woolf and Siri Hustvedt. Yes, you can see the problem. Only one woman. But not surprising given the era that's covered. Gender equity would mean the inclusion of obscure works most of us have never heard of, denying readers the pleasure of connecting with the familiar. This is not a scholarly text. It's (as the blurb says) an armchair traveller's guide to magical realms. Literary Wonderlands takes you on 100 adventures to fictional worlds you may be familiar with already or places you have yet to discover. This beautifully illustrated hardback book is perfect for book-lovers. It will take you from the time of ancient myth and legend, through the golden age of fantasy, right up to the contemporary computer age. As you journey through the ages, these literary wonderlands will also transport you throughout the world. Some of the locations are real such as the Spain Literary Wonderlands takes you on 100 adventures to fictional worlds you may be familiar with already or places you have yet to discover. This beautifully illustrated hardback book is perfect for book-lovers. It will take you from the time of ancient myth and legend, through the golden age of fantasy, right up to the contemporary computer age. As you journey through the ages, these literary wonderlands will also transport you throughout the world. Some of the locations are real such as the Spain of Cervantes’ Don Quixote or the near future California of Neal Stephenson’s Snow Crash. However, some are purely fictional such as down the rabbit hole with Alice in Wonderland, Peter Pan’s Neverland and Harry Potter’s Hogwarts. You will also journey to the Moon with Cyrano de Bergerac, under the sea with Jules Verne and to other galaxies with Douglas Adams. Each entry explains a bit about the plot of the book, describes the setting created, often tells a little of the historical context when the author was writing and talks of the place it held in people’s thoughts then or now. Each entry is also accompanied by original illustrations, author photographs and occasionally film stills. As I flicked through the book, choosing entries at random to read, many childhood memories were evoked. For example, I remembered how much I enjoyed The Lion, The Witch and The Wardrobe, so much that I had to read about all the other adventures set in the magical world of Narnia. I loved the inclusion of the illustrations I remembered from Alice in Wonderland and remember being terrified by the Queen of Hearts! The Wizard of Oz is probably more associated with the film these days but I do remember borrowing the book and some sequels from my library and being surprised at the differences from the film. Perhaps a first introduction that the book is almost always better than a film adaptation! A more recent discovery (though more years ago than I care to think about actually) is the magical Discworld created by the late great Terry Pratchett. I was introduced to Discworld by my husband who, not long after we met ,recommended that I read Mort. I did and I was hooked – and I don’t normally enjoy fantasy type books. I am not gonna lie, I did not read this entire thing. But I am considering it read since it has grown my to-read list by around 25 books. I read the sections for books that I have already read. I was so glad to see some of my favorite series added to this collection. The rest I skimmed just enough to see if it where something I might like and then promptly added it to my list if it was. The sections themselves are very interesting. It gives you a little information about the author, some mytholog I am not gonna lie, I did not read this entire thing. But I am considering it read since it has grown my to-read list by around 25 books. The sections themselves are very interesting. It gives you a little information about the author, some mythology if it applies, and a quick insight into the story. It never gives spoilers or makes you feel like you have read enough information so there is no need to read the book. I liked the mixture of books. There were well knowns and very obscure books(well, to me anyway). There were a lot of books that I have never heard of before. One of the great pleasures of ‘real’ books for me is the presentation. It might sound ridiculous, but Literary Wonderlands appeals to almost all my senses. The quality of the materials here is so lovely to touch with smooth, crisp pages that make the spine give Literary Wonderlands explores the settings and creation of books spanning 4,000 years. A great look at some of the most imaginative literary worlds. I wish there had been more information on some places I was interested in, but all in all it was a light and pleasant diversion. Narnia. Middle Earth. Oz. Wonderland. The worlds of fantasy and science fiction are part of what draws us to them. Among the longest-lasting are the ones that create their world so fully that you can picture where things are on the map--and indeed, many of our favorites have actual maps in their end pages. How many times have you flipped back to Mirkwood, to Cair Paravel, to the Emerald City to get oriented as your follow the heroes through their adventures? These are some of my favorite books, Narnia. Middle Earth. Oz. Wonderland. The worlds of fantasy and science fiction are part of what draws us to them. Among the longest-lasting are the ones that create their world so fully that you can picture where things are on the map--and indeed, many of our favorites have actual maps in their end pages. How many times have you flipped back to Mirkwood, to Cair Paravel, to the Emerald City to get oriented as your follow the heroes through their adventures? These are some of my favorite books, and what initially drew me to "Literary Wonderlands: A Journey Through the Greatest Fictional Worlds Ever Created." The worlds I already knew were what drew me to the book, but it quickly became much more, and much more engrossing than that initial interest. I was expecting a kind of gazetteer, with maps for each of the worlds. Maybe twenty different books total, from the 19th and 20th centuries. But the book is much more comprehensive than that. The worlds begin with "The Epic of Gilgamesh" and "The Odyssey," and the final book included is Salman Rushdie's 2015 work "Two Years Eight Months and Twenty-Eight Nights." I was expecting traditional English and American literature -- the kind of thing I read in my high school English classes twenty-mumble years ago. But there are books from Japan, Russia, Spain, Argentina. All with English translations of course, but each opening my eyes to larger worlds beyond the traditional science fiction and fantasy I was already familiar with. Most of the entries are just two pages long, but there are many that are twice that. The full-color illustrations throughout highlight are frequently the contemporary illustrations from the books, with other photographs, film stills, and works of art thrown into the mix. There are many classic works that I don't typically think of as being "genre" literature, but are included here -- things like "The Divine Comedy" and "The Tempest" definitely build worlds that are unique to those stories, as do Wagner's "The Ring of the Nibelung" and Twain's "A Connecticut Yankee in King Arthur's Court." While I was expecting an atlas or gazetteer of maps, "Literary Wonderland" is more thoughtful than that. Most of the entries don't even have maps, and the essays range from analyses of the landscape and fictional worlds to biographies of the author, and what life experiences shaped the creation of those worlds. While most of the entries make solid connections to the books and characters, there are a few that stand out as...not. The biggest disconnect for me was "Peter Pan in Kensington Gardens." I learned a lot from it -- the history of Pan publishing by J.M. Barrie -- but what I didn't get was any Neverland. At all. For me, that's one of the classic otherworlds that the book would cover -- in fact, it's on the cover of the book, immediately above the title. Why exclude an analysis of one of the most interesting, imagination-fueling locales in fantasy literature? Missing-Neverlands aside, this was an entertaining and engrossing read. It also reminded me of the classics I haven't read ("Discworld") and made me reevaluate some of the ones I have ("A Clockwork Orange.") It also added about thirty titles to my To Read stack, which is already right around eight hundred titles. I have time. This isn't a terrible collection of "literary wonderlands"...it just isn't a very comprehensive one. It's basically a subjective "Best Of" list in book form, which skews heavily towards science fiction. There are a LOT of dystopians on the list. Each book is briefly described in a 2 - 3 page essay, with pictures. Still, I managed to use it to find more books to read. I've got a handful of books from it that I didn't know existed, but liked the sound of. (And I'm supposed to be cleaning OUT my to r This isn't a terrible collection of "literary wonderlands"...it just isn't a very comprehensive one. It's basically a subjective "Best Of" list in book form, which skews heavily towards science fiction. There are a LOT of dystopians on the list. There's beauty to Literary Wonderlands: First, in the physical object. The paper quality is excellent and combined with the ink the artwork and photographs look fantastic on each page. It's also satisfyingly hefty. Second, in how it's organized. The works are divided by era, starting with 'Ancient Myth & Legend' and concluding with 'The Computer Age.' These larger frameworks create neat divisions of thought, and help contextualize the history. Third, the writing is rather good for the first t There's beauty to Literary Wonderlands: First, in the physical object. The paper quality is excellent and combined with the ink the artwork and photographs look fantastic on each page. It's also satisfyingly hefty. Third, the writing is rather good for the first three sections of the book. The contributors talk about the premise of each work, the background of the author, the world they've built, how it reflects the real world and what influence it may have. This last point is probably the most satisfying part of Literary Wonderlands: You can see how everything is interconnected, how science fiction and fantasy are part of a larger narrative and larger traditions. As I read the book, I kept thinking how it would be an excellent syllabus for a class on speculative fiction and how I would love to teach that course. Unfortunately, these were but early impressions, and as I moved forward in the book and forward through history thing got shakier as we entered the realm of more well-known literature, and less "classic" literature. To books that people were more likely to have read... and have personal bias about. The first section or two felt relatively neutral, but later on it felt like people had their personal faves... as well as bones to pick about other works. The writing becomes sloppy at points. Do we really need a plot synopsis for 1984 or The Castle? Those single books get as much or more page space as classic (and much longer) series like Narnia or Discworld. The part about Infinite Jest is both long and rather insufferable -- how disappointed I was to find out it was written by Lev Grossman. There's also the sense that the writers don't particularly like the works they've written about: The Hunger Games, The Giver and Inkheart aren't just critical about their books (as they should be) but also a bit condescending. It feels as if the writers were assigned these works and that they were only included in the book because they felt they had to -- especially Harry Potter and the Sorcerer's Stone. * Full list includes 27 titles and I didn't print it for sanity's sake. First things first: I loved this book. Now that that's out of the way... have you ever shared a non-fiction book with someone, say Laura Miller's Literary Wonderlands, and have them go: "Oh, but it lacked so many other good books! ", "They didn't analyze them in-depth! ", "You're so dumb because you haven't read proper papers on each book mentioned", and you're like: "Dude, it's a reference book. I learned of books I didn't even know existed and now I want to read. It's not an in-depth examination First things first: I loved this book. Now that that's out of the way... have you ever shared a non-fiction book with someone, say Laura Miller's Literary Wonderlands, and have them go: "Oh, but it lacked so many other good books! ", "They didn't analyze them in-depth! ", "You're so dumb because you haven't read proper papers on each book mentioned", and you're like: "Dude, it's a reference book. I learned of books I didn't even know existed and now I want to read. It's not an in-depth examination of each one mentioned, nor can they mention every great work of literature, even in a hardcover coffee table volume!". I kinda hate, and often have to deal with, snobbish people such as this, particularly the literary snob type who'd hang the whole value of their "intellect" on them proving their superior knowledge in comparison to yours, rather than the knowledge itself. Hundreds of papers have been written on El Quijote alone, for example; how many are there examining every piece of the literary canon and beyond? Newsflash, the average life expectancy of a human is around 28,000 days, and by day 2000 you've barely graduated to books with words, so expecting anyone to have read every book ever written (or, heck, even every book considered for the literary canon) is not just illogical, but plain, stupid, and plain stupid. Much less a reference book of 320 pages and about half that many entries. "Literary Wonderlands" is a well-led tour through the history (broken into five time frames - beginning with "up through 1700," and concluding with "1981 to present" that highlight genres and ideas from that age) of the most well-read (and loved) fictional worlds brought to life by some of the most intriguing writers one could imagine. I found myself further researching authors I was not as familiar with and the availability of their work. It was also enjoyable to browse familiar authors and the "Literary Wonderlands" is a well-led tour through the history (broken into five time frames - beginning with "up through 1700," and concluding with "1981 to present" that highlight genres and ideas from that age) of the most well-read (and loved) fictional worlds brought to life by some of the most intriguing writers one could imagine. I found myself further researching authors I was not as familiar with and the availability of their work. It was also enjoyable to browse familiar authors and their work and discover an unknown nugget of information here and there. Use this book as a menu to new reading dishes. It offered to me a variety of books which appear tantalizing and also some which I had previously dismissed but now am willing to taste. However, this book has a structural and fundamental identity problem which makes it almost unreadably didactic and incongruent. It reads like a bunch of high school book reviews flogging a common thesis to varying degrees of bloody torture. Some entries merely sting like a rubberband thwack. Some Use this book as a menu to new reading dishes. It offered to me a variety of books which appear tantalizing and also some which I had previously dismissed but now am willing to taste. It reads like a bunch of high school book reviews flogging a common thesis to varying degrees of bloody torture. Some entries merely sting like a rubberband thwack. Some get seriously cat-o-nine British Empire navy on one's metaphorical back. None satisfy and some, even worse, turn a reader off to a potentially pleasurable reading experience by imprudently over-analyzing a text which well enough leaves alone. Ms. Miller has apparently reviewed only two of the many texts herself and even these do not accomplish her aim: to portray brilliantly crafted literary realms in such a way that she convinces the reader to send whatever reviewed text to the top of their reading list. More often than not the reviews end with a thud, clumsy speculation, and/or no point. 90% of the entries might as well stand as synopses and not essays. This travelogue of fictional worlds was fascinating, entertaining and educational. The book was divided up into different topics, each with a certain year range, and the entire book was in chronological order. Beginning with Ancient Myth and Legend, with the first entry being The Epic of Gilgamesh from 1750 BC, through to The Computer Age with Salmon Rushdie's Two Years, Eight Months and Twenty Eight Nights, the literary lands discusses span centuries and the globe. Each book, and world, that is This travelogue of fictional worlds was fascinating, entertaining and educational. The book was divided up into different topics, each with a certain year range, and the entire book was in chronological order. Beginning with Ancient Myth and Legend, with the first entry being The Epic of Gilgamesh from 1750 BC, through to The Computer Age with Salmon Rushdie's Two Years, Eight Months and Twenty Eight Nights, the literary lands discusses span centuries and the globe. Each book, and world, that is talked about is described from several different angles. The author, his beliefs and thoughts are explored, as well as the fictional world of the book itself, and the historical, scientific and artistic ideas of the period that went into the formation and creation of the book. Of the books I read, and was familiar with, the ones whose descriptions I most enjoyed reading were Le Morte de Arthur, Lord of the Rings, Harry Potter and the Hunger Games. They provided a behind the scenes look at the creation of these books. Of the books I was not as familiar with, I really enjoyed learning about Kafka's The Castle, Asimov's I, Robot (I had only seen the film) and Game of Thrones, I have not read it. Literary Wonderlands showcases some of the best-known and most noteworthy fantasy / speculative fiction in Western Literature. It works well as a coffee-table book - it is lavishly illustrated, interesting, and, lends itself well to casual browsing. The books - from The Epic of Gilgamesh to Shakespeare to H.G. Wells to William Gibson, are arranged chronologically and also around four distinct themes. The writers bring their considerable knowledge of literature and history to shed light on the origin and context of these works. If speculative fiction is your thing, this book will offer some excellent ideas for future reading.